The single species classified into this taxon is Ogygoptynx wetmorei Rich and Bohaska, 1976, which is the earliest strigiform bird yet reported. O. wetmorei is represented by a tarsometatarsus from the late Paleocene (Tiffanian) of Colorado (Rich and Bohaska 1976, 1981). The bone is elongate and slender as in crown group Tytonidae, and more closely resembles the tarsometatarsus of extant owls than do the tarsometatarsi of Berruornis and the Protostrigidae. In particular, the enlarged trochlea for the second toe distally exceeds the trochlea for the third toe in length (contra Protostrigidae), and, in distal view, the trochleae are arranged on a markedly curved line (contra Berruornis). A presumably autapomorphic feature of Ogygoptynx concerns the shape of the proximal end of the tarsometatarsus, whose outline is, in proximal view, shaped like a parallelogram, not rectangular as in other Strigiformes. 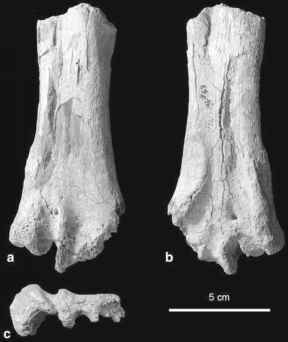 Despite being the earliest known strigiform, the far distally reaching trochlea for the second toe and the arrangement of the trochleae indicate that O. wetmorei is more closely related to crown group Strigiformes than are Berruornis and the Protostrigidae (Mourer-Chauvire 1987). However, although Ogygoptynx is likely to be outside crown group Strigiformes, the fossil material does not allow an unambiguous further assessment of its affinities. Given that the age of Ogygoptynx has been correctly determined, this taxon significantly complicates our understanding of the early evolution of owls. Not only does the essentially modern appearance of its tarsometatarsus conflict with the presence of very different and apparently much more primitive owls in the Paleocene of Europe, but it also conflicts with the absence of similar "advanced" owls in later, i.e., Eocene, deposits of North America.